The second quarter ended on a high note for both the business and leisure travel segments. Global leisure travel booked online yielded impressive reservation and rate growth during the second quarter, growing by +10.2% and +6.5% in June respectively. This represents the highest year-over-year growth for both leisure measures over the last 12 months. 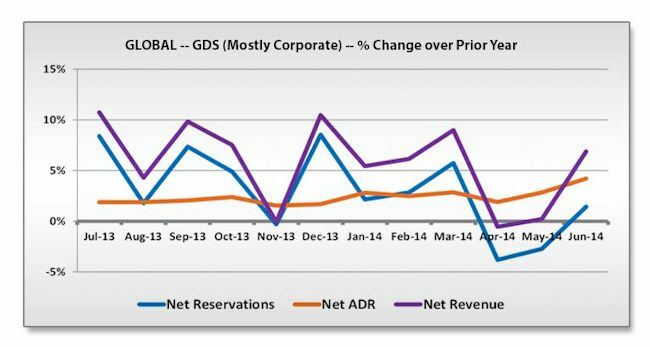 Corporate bookings and average daily rates (ADR) through the global distribution systems (GDSs) reached global year-over-year growth of +1.4% and +4.2% by June. Forward-looking data suggests more growth in store through the beginning of autumn. Pricing remains a powerful influence, but substantial rate growth indicates it is not the only factor driving booking decisions, especially as online channels attract more corporate shoppers. More than ever, an effective online presence (on both the hotel website as well as through online travel agencies and meta search sites) is essential to capturing your fair share of the bookings available. 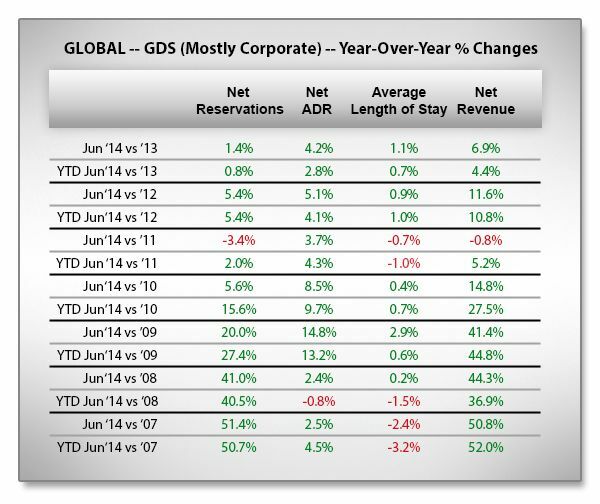 Global performance through the GDSs reflects substantial corporate travel demand for the quarter. While business bookings eased below prior year in April by -3.8% and in May by -2.7%, reservations rose above prior year by +1.4% in June. The slower year-over-year growth in April and May was due in part to several global and regional holidays falling closer to the weekend than prior year, encouraging more leisure travel. Despite the relatively minor fluctuation in global corporate travel volume compared to last year, hotels are consistently achieving higher room rates for business stays. 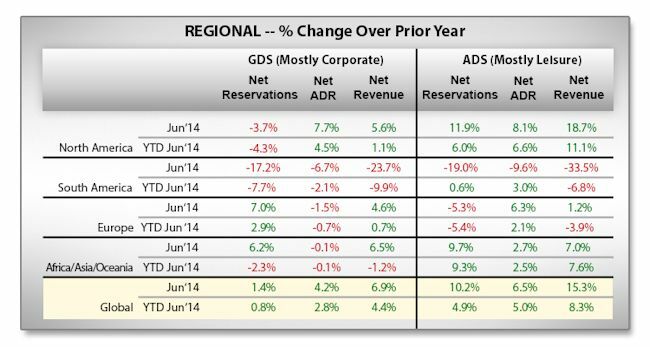 Even during April and May’s slight dip, ADR increased by +1.9% and +2.8%; reaching a recent growth high of +4.2% with increased reservation volumes in June. Steady rate growth speaks to strong corporate travel demand that is not being overshadowed by excess new room supply, in most markets. Transient, or independent, business travel is on the rise globally, along with group business travel. Transient has been the most resilient as an effective means of satisfying more specific client and internal needs. Group business has also returned as reflected by slightly longer lengths of stay and booking windows for the quarter. Conferences typically involve longer stays booked further in advance than transient trips. Year-to-date through June, the average length of stay has increased by +0.7% (2.15 nights in 2014 versus 2.14 nights in 2013), increasing by +1.1% in June (2.13 nights in 2014 versus 2.11 in 2014). Similarly, the average booking lead time increased from 16.73 days during second quarter 2013 to 17.05 during second quarter 2014. Conference and convention travel results vary by location, and are impacted by factors such as government cutbacks and austerity programs. For the most part, companies are feeling more profitable and confident to spend on travel that will generate profit. This is also supported by data from Marriott International, Host Hotels & Resorts and Hyatt Hotels Corporation citing gains in group revenue related to second quarter 2014 bookings from +8% to +13%. Second quarter leisure travel also experienced strong demand, delivering increasing global revenue growth to the delight of hoteliers. Holiday bookings grew over prior year at an increasing pace, from +3.8% in April to +4.1% in May, and finishing up a staggering +10.2% in June. Rate growth also accelerated from +4.1% in April, to +5.3% in May, ending the quarter up +6.5% over prior year in June. A combination of pent-up demand, increasing financial stability and travelers making vacations a priority contributed to the increases in leisure volumes and rates. Even as Baby Boomers drive strong leisure demand, Millennials (aged 18 to 35) are expected to spend incrementally more on travel services than any other age group over the next 12 months. Travelers have shortened trips to allow greater spend on room rates and services by limiting room nights. Year-to-date through June, the average length of stay (LOS) shrank by -1.4%, from 2.01 nights in 2013 to 1.98 nights in 2014. June’s average LOS shortened from 1.97 nights in 2013 to 1.94 nights in 2014. Shorter trips lend themselves to shorter planning and booking lead times, reinforcing the importance of a strong online and mobile presence. By allotting budget for extras, smart hotels will also ensure extra services are offered in any online booking experiences. Year-to-date for June, trips were booked an average of 20.86 days ahead of check-in, as opposed to an average of 20.73 days ahead year-to-date in June 2013. Because business travel performed well over the second quarter, most regions experienced positive revenue growth. Booking growth eased in North America as rate gains reaching +7.7% in June pushed revenue to grow +5.6%. Europe and Africa/Asia/Oceania experienced a boost in business bookings of +7.0% and +6.2% by June. With rates nearing prior year levels, this drove revenue growth of +4.6% in Europe and +6.5% in Africa/Asia/Oceania. While South America saw business travelers diverted thanks to the FIFA World Cup in Brazil, the region also experienced a drop in online leisure bookings and rates in June. During times of high demand, savvy hoteliers will strategically limit room inventory available to more costly third party sites to drive more profitable direct bookings through the hotel website or call center. Rates will also fluctuate as booking patterns, media hype and room availability adjust throughout the event. As reported in the industry, high room rates at the start of the year priced many Brazilians and nearby regional fans out of the market, causing many hotel companies and intermediaries to readjust rates downward. 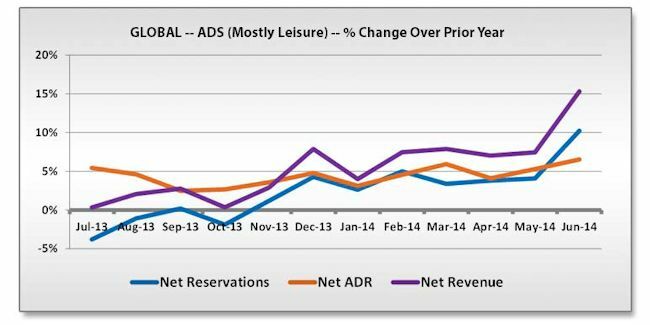 Leisure rates clearly played a major role in driving revenue across all other regions. In North America, double-digit booking growth of +11.9% in June, boosted by high rate growth of +8.1%, drove revenue growth to a remarkable +18.7%. Africa/Asia/Oceania’s ADR has also been consistently bolstered by strong reservation increases, keeping revenue +7.6% ahead of 2013 year-to-date. Europe’s substantial ADR growth of +6.3% in June overcompensated for a dip in bookings compared to 2013, salvaging revenue growth at +1.2%. Consistent year-over-year rate growth can be attributed to increasing demand that is still outpacing overall supply as hotels apply continually improved rate and distribution strategies. Global GDS forward-looking data shows an ease in business bookings compared to prior year during July and August, months that are prime leisure travel periods. The channel will pick up again in September and October with strong rate growth, increasing at an average pace of +5% over prior year for bookings made for stays through October to-date. Organizations such as the Global Business Travel Association (GBTA) continue to confirm a positive outlook for 2014 business travel. GBTA estimates U.S. business travelers alone will spend $292.3 billion this year, +6.8% more than 2013. Group meeting and/or convention travel spend is expected to increase by +7.1%. Business trips abroad are also predicted to grow by +6.6% this year, with the amount spent greater than 2013 by +10.3%. 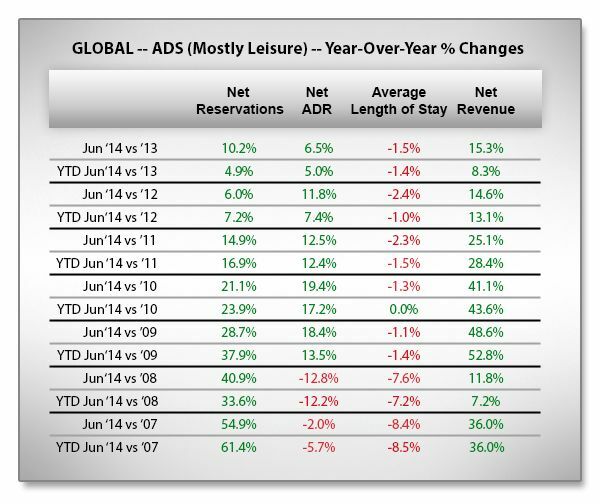 ADS channel forward-looking global data indicates robust leisure travel through summer. Bookings made thus far for arrivals July through September are averaging +8% over prior year as room rates average almost +8% higher as well. Even with the average number of room nights per stay curtailed, these gains in reservations and rates look to keep revenue growth in the double-digits into September. 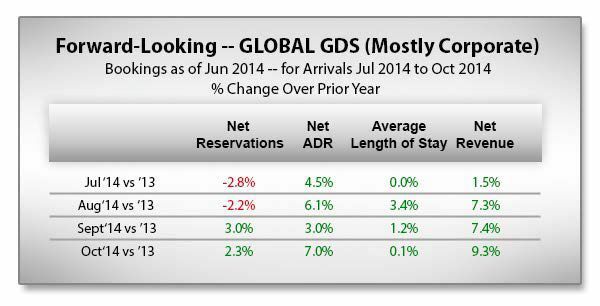 In fact, forward-looking data suggests the highest booking gains may be realized in August and September. Summer travelers are booking later in the season as many have yet to book their holidays. This creates real and immediate opportunity for hotels to fine tune their rate and distribution strategies, especially online, to win this year’s summer traveler. The Pegasus View is a quarterly analysis of global booking trends available online at www.pegs.com. Data reported in The Pegasus View comes from billions of transactions processed monthly by Pegasus Solutions, the world’s single largest global processor of hotel transactions. It is the only industry report to reflect data drawn from both global distribution system (GDS) and alternative distribution system (ADS) transactions, representing the business and leisure markets respectively for approximately 100,000 hotels worldwide. All data is on a date-of-booking basis unless otherwise stated. Average daily rate (ADR) and revenue percentage changes are calculated from values using a single constant exchange rate to eliminate the effects of currency exchange rate movements. Pegasus Solutions is the single largest processor of electronic hotel transactions, delivering advanced and affordable connectivity and distribution solutions to nearly 100,000 hotels worldwide. Connecting hotels to crucial sources of business, Pegasus processes transactions valued at 14 billion USD annually. In addition to foundational global distribution system (GDS) access and online connectivity, Pegasus delivers online, social marketing and booking solutions through its Open Hospitality division, and powerful reservation tools to convert and capture bookings. As a trusted partner in generating guest room demand and sales, Pegasus also offers hotels actionable business intelligence through its PegasusView Market Performance reports to help hotels understand and respond to changing market conditions.